Written for those who are new to beekeeping, this book aims to clarify the essential procedures that are associated with the subject. Step-by-step instructions take the newcomer through each stage, with photographs and illustrations to further clarify the techniques. This is an essential guide for the beginner during the first few years of beekeeping and exceptional value. 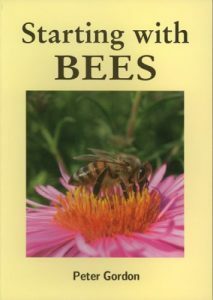 The book assumes no prior knowledge of beekeeping so is great if your are only just thinking about becoming and apiarist. It is also so packed full of helpful information you will find yourself referring back to it time and time again. Available both new and used from Amazon for as little as a penny plus postage. Having since read a couple of other larger & more detailed books on the subject, such as Ted Hooper, I’m sure that I would have been somewhat confused if that’s what I had started with. This book assumes no prior knowledge, introduces the subject in a logical order & goes into quite a lot of detail without getting too technical & offputting.